Miles Outside Dehydrated Baby Food | GetOut! Yes, you can take your baby backpacking and here’s one thing to make the job easier. (Although if you are the type to take a baby backpacking, you probably aren’t afraid of a little work.) 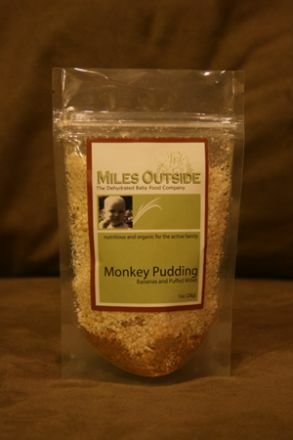 Miles Outside provides single-serving, millet- or oatmeal-based, dehydrated baby food. You just add water – you don’t even need to heat it – and in a few seconds, it’s ready for your baby’s mouth. The meals are flavored with cinnamon and fruit – apples and bananas. No added sugars and these meals are all organic. Our tester, 10-month-old Rowan, loved ’em.